I grew up at 261 Hobson Street in the 50s and 60s, right next to the orphanage (I think it was St. Peter's, but not sure). Hobson Street runs between Goldsmith and Chancellor Avenues. The entire street consists of 4 unit apartment buildings separated by concrete or asphalt alleyways which lead into the backyards where there are the 4 unit storage/garages. There were no fences between buildings, so we kids ran and rode our bikes freely up and down the block in the back by the garages. Our moms (none of whom worked outside the home) used to bring out folding chairs and sit and gossip together while we kids played. It was like one big extended family if you had to pee when you were all the way down the end of the block, you used Mrs. Rackenberg's bathroom. If you were hungry at Mrs. Weisser's, she'd give you a piece of buttered matzoh. Thickly buttered, as this was when most people would think "Cole Esterol" was a freshman at Weequahic High! Just as Betty Smith wrote in "A Tree Grows In Brooklyn", a child's world is bounded by the neighborhood stores. My world on Hobson Street was bounded by the stores within walking distance The Chancellor Deli, where we'd go to eat monumental corned beef and pastrami sandwiches, the "corner store" where'd I be sent to pick up a loaf of Wonder bread, the kosher butcher, with the sawdust on the floor, and the pharmacy, with that long wondrous glass display counter filled with penny candy that really DID cost a penny! We kids either walked or rode our bicycles everywhere. We were lucky to have Bernheim's funeral parlor at the corner of Hobson and Chancellor, because we could ride our bikes freely in the parking lot. A really big deal would be to walk with Mom to the Pik-N-Pay for the big shopping order, or to Two Guys, a store that surely had everything! I used to get my Keds sneakers and my summer sunsuits there. Both my grandparents lived in Newark as well. My maternal grandparents (Max and Anna Ehrenkrantz) lived on Wainwright Street in an apartment over some stores. Their windows looked out over Lyons Avenue. I was allowed to walk there to visit, and did often. Once a week, my Mom and I would walk to Ming Toy's Chinese restaurant on Lyons Avenue and have the usual fried rice, wonton soup, spare ribs, and chicken chow mein. It seemed so........so.......exotic! My other grandparents (Nat and Bess (Bornfeld) Wagenheim lived on Vermont Avenue. We drove to their house once a week for a family dinner. On occasion, my Nanny Bess took me by bus to downtown Newark, where we would shop the "fancy" stores S. Klein and Bambergers. I can still remember the unique smell of the Bamberger's store wood polish, glass cleaner, and wool. A special treat would be coffee and a doughnut at Chock Full O' Nuts. Yes, I was given coffee to drink, nobody thought it would stunt my growth, and it didn't I'm a very female 5'8" tall! 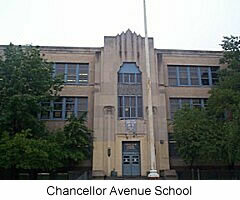 I went to Chancellor Avenue School. We walked up Goldsmith Avenue and through the playground. My kindergarten teacher was named Mrs. Herman, and she was very petite. The first day of school I remember that Todd Applebaum's mother had to drag him in kicking and screaming. Poor Todd. Poor Todd's mother! Mrs. Herman was a wonderful teacher. Being so petite, she couldn't reach the classroom phone. It had a mouthpiece that was part of the wall unit and a receiver that you held separately to your ear. Mrs. Herman had to bring a stepstool to answer the phone, and we used to laugh at her for that. She told us, "It isn't how big a person is outside that counts, it's how big they are inside." As you can tell, Mrs. Herman's lessons stuck. I also had the good fortune to have Mrs. Duchin for second and third grades. I just adored her! She was so patient, so kind, and so effective. My dad (William Wagenheim) had a business downtown called Parts Unlimited, which was at 260 Washington Street. I used to help out when I was a teenager. When I worked with him, he would take me to lunch at Ray's Delicatessen on Bradford Place. Like many families, we spend summers at Bradley Beach. We stayed in a cottage on Beach Avenue, and I have many fond memories of the 4 summers we spent there. My dad would take the train from Newark on Friday and stay the weekend, then return to work. My pediatrician was Dr. Seymour Charles whose offices were at Lyons Avenue across from Beth Israel Hospital. He was my pediatrician for many years. In my 20s, I went to medical school at UMDNJ- New Jersey Medical School on Bergen Street. As a third year medical student, I did my pediatrics rotation at Beth Israel, and lo and behold, who did I meet, still making his rounds there? My pediatrician, Dr. Charles still dedicated, still serving, still committed to caring for the children of Newark. The day I ran into him was Halloween, and to cheer up the hospitalized kids, he was dressed as a clown with a GIANT red nose. I still recognized him. And he, bless his heart, remembered me as a kid. I would dearly love to find some of my childhood friends and classmates, so if you went to Chancellor Avenue School between 1960-1970, I'd love to hear from you!